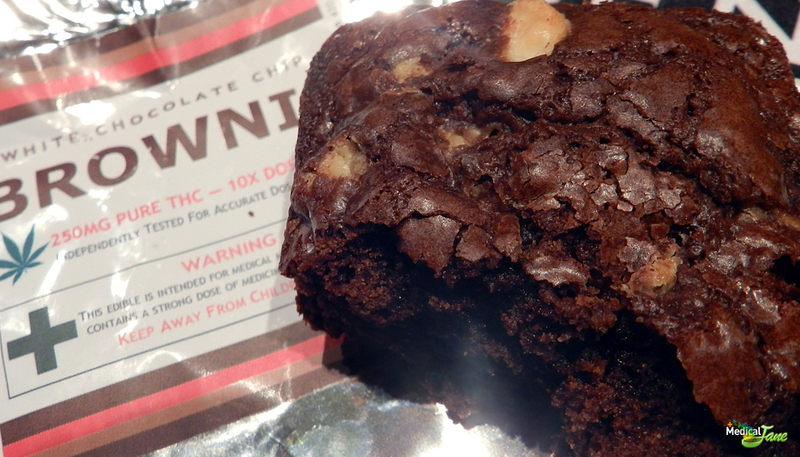 Truly Edibles White Chocolate Chip Brownies are sold in both 10X and 4X potency. It is recommended that patients eat half in one sitting for the most pleasurable experience. I had the entire brownie in one sitting but it was pretty powerful and almost overwhelming. Would not recommend that to anyone unless you have a very high tolerance for ingesting cannabis. It was a bit too spacey for my liking and ended up making me really, really tired. Wait up to 1 full hour for the full effects of edibles to kick in. Effects may be much quicker though, depending on how empty your stomach is. The brownie was slightly dried out and had a harder chocolate shell than it should of had. Needless to say we have reviewed many better brownies throughout California. Having said that, there are a lot of positives from this $25 piece of chocolate. The heavy body melt and strong potency of this brownie makes it great for patients suffering from insomnia, sleep-apnea, or other night-time related disorders. Also, the medicine is full-bodied and provides a significant rush of pain-relief to all parts of the body. Great for curing those minor aches and pains that keep you up at night.